Why Isn't a Pretty Girl Like You Married? , by Nancy Wilson was published by Canon Press back in 2010. (Must have been late 2010.) I'd been wanting to read it ever since it was released (not because I'm single but mostly because I'm not) and I purchased a copy off of Amazon just within the last few weeks. I saw the notice, "One left in stock!" and ordered it (without worry or care) only to discover after the fact that that was literally the last copy. I checked with my contact at Canon Press and the book is currently out of print. If and when (?) it comes back, I will let you know post-haste. In the meantime, try to find a copy. I checked Christian Book Distributors and they do not have a copy either. 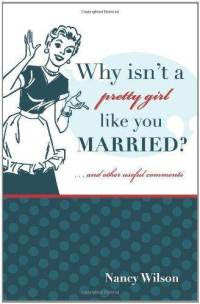 Why Isn't a Pretty Girl Like You Married? must now be obtained through the black market apparently. (I jest. Sort of.) I have my copy and if I personally know you and you are in the local area, you can borrow it. (Hint to several of my local friends.) If you live far away and you want to borrow my copy (with intent to return) maybe we can set up a mailing system. I feel this book ought to be read. Digested. And perhaps even thoroughly enjoyed. Once I got down to typing up my thoughts on this particular title, my post got a little long. So I'm going to split this discussion up into two sections. The first part will post today (ta da!) and the second, tomorrow. Although Nancy Wilson is addressing an audience of unmarried women, I did not feel as if this book is exclusively for that sect. Of course, it's a very practical reading tool should you be an unmarried female - but if you are the mother of one, or the friend of one, or generally know unmarried sorts, this is worth a read. It has the ability to advise, instruct and inform no matter what stage of life you are currently in. I was personally convicted by many of the things that Mrs. Wilson had to say and the rest I either nodded sagely at or laughed along with. Anyway . . . she says useful things. For starters, I love that she points out right from the start that we should absolutely and under no circumstances refer to unmarried people as "single." We should not set them apart from the Body of Christ as a group and label them as being by their individual selves. Rather, we should recognize that they help make up the Body as a whole and are therefore equally valuable and necessary as those who are married and/or have families. Married people do have a tendency to think in terms of sharing fellowship with other married people only. It's true that being around unmarried friends can grow awkward at times. I think it would be generally unrealistic to say that awkward situations do not arise when the unmarried participate in the family life with married couples. Then, it is equally unrealistic to say that the two stages of life cannot find common ground. Certainly some boundaries must exist between the two but I believe Wilson has made an incredible point here. Having been "single" for much longer than most of my friends did growing up, I experienced some period of time where I would attend church alone. And no one seemed to know what to do with me. I certainly was not invited over for lunches or dinners or asked to participate in many activities with my specific church family. That made the lonely road even more lonely at times and I realized then how important it is to invite unmarried people into friendships and family lives. Just because they aren't married does not mean that they aren't people. In fact, some of my unmarried friends now are some of the most intriguing, engaging and interesting friends that I have! (You know who you are, oh yes, you do!) We married people need to include unmarried people in our lives and vice versa. It may prove awkward at times, yes. But we are all part of the Body of Christ and we need to learn to behave like it and recognize that each sort has a contribution to make to the whole. One reason I was glad to read this book is that I don't care to forget how awkward it can be to not be married. (It's like saying I don't want to forget what it feels like to be a kid, so that I can understand my own children.) There are fears and trials that an unmarried person faces that are unique and difficult in today's world. And we married people can say the stupidest and most hurtful things to people who waiting and longing to be in the position that we are in. We need a lot of grace to be able to speak in a manner that is pleasing to the Lord as we deal with one another. Wilson is specifically encouraging the unmarried woman to extend grace towards older/married people who make discouraging and offensive comments. I would say that we marrieds need to think about the words coming out of our mouths and try to avoid insensitive remarks. Did you catch that one sentence in there? Realize that each comment has come with God's permission and view it as part of your sanctification. Has anyone else out there realized that women make a very bad habit out of generally saying insensitive things to one another all the time and in all stages of life. (There are lists of insensitive remarks that women make about other women who are pregnant, for example!) Learning to cull our words down to the beneficial ones is important. Extending grace when the other speaker has failed to put their personal filter over their mouths is another thing to learn. We should probably learn this lesson though - and the sooner the better, for the sake of Christian fellowship! May we commit our hearts and tongues to the Lord that we may glorify Him in all of our relationships, in each special season of life! Wow. The last copy. The title alone made me curious. This sounds fabulous. Last night for the first time as a couple (vs. me during the day) had an unmarried friend over for dinner. It was also our first time having a missionary here. This looks outstanding. I was married young (less than a month after turning 19), so I think my perspective will be different and it would be good for me to read this. As much as the prevailing culture is "anti-marriage" (living together, homosexuality, finding self/pursuing careers, divorce. . .need I go on??) I find it ironic that there is still such an expectation for marriage and those who marry a little later than early 20s almost seem to be viewed as though something is wrong with them. Isn't that crazy?! Looking forward to part 2--you have my mental gears spinning already! Interesting thoughts on married/single friendships. For several reasons, DOB and I have always found it easier to socialize with single people (or couples without children) if only because then we don't have to coordinate multiple nap schedules. :-) Just "Hey, come over, we'll have a meal and put the kids down and then we can play games." That looked a little different when we lived in a city with a church with a large college presence--our current church doesn't have many young, single adults and I still haven't worked my nerve up to break into the Old Lady Network--but we now spend a lot of time with our twenty-something siblings. I think it also helps that both of us naturally make friends easily across gender lines, so it doesn't feel like someone is left out to have only a man or only a woman over. Kindle lovers will be happy to note that this book is available for $7.00. Nice to see you at least acknowledge the potential use of a Device That Shall Not Be Named in preserving the availability of a book that would otherwise have gone out of print. This book does sound spot on. I have been thinking about this lately after a friend became suddenly widowed. The category of "single" does indeed exclude, and many churches aren't really interested in looking beyond the categorization of everyone. This applies also to the divorced and the unmarried. Why shouldn't we simply look at people as people and socialize with those of all ages, relationship status, childbearing status, etc.? I like to talk about my kids, but I also like to talk about many other things; so why would I want to hang out only with those in my "peer group"? It's me isn't it? Oh, you don't have to say it...I know. I'm looking forward to part two, and when Emily (who beat me to it...darn it!) is done may I have it? I know I did spill coffee on that ONE book, BUT I shall place this on my hope chest (hah...oh yes, I have one) where nothing will ever happen to it! Yes, I've come to a place where I'm ok with those comments. I actually read a post that talked about "things not to say to unmarried people," and I laughed ALL the way through it because I've had them all said to me. Most of the time I have a good attitude about it and assume that the only reason they are saying these things is because they are worried about me. This helps. In other news, someone came to my blog on a Google Search for "christian reviews of the mysterious benedict society". Out of curiosity for my own page rank, I googled it myself and found that... wait for it... my review ranked higher than yours (nanner-nanner). I was absolutely flabbergasted and am wondering if it's a mistake (maybe they put it on the first page on my own search but not on other peoples'?) since you're a much better reviewer than I! (And then I debated about sticking in the bit about the *i*d*e and decided against putting it in. BUT! I will put it in tomorrow's post, how 'bout that?! LOL to Bekah. HA! You would gloat over that. hahahahaha!! Well, if I have to come up under someone else, I am happy to be under you! I so agree about not isolating "singles" off into their own classes like they don't "belong" with the rest of the body of Christ. Even the word single sounds lonely and isolating. And we marrieds do need to be more watchful of what we say and more aware of how things can be taken and may sound hurtful. Wow--I do like that comment about God allowing what is said to us!! And this spoke to me. I've often reached out to divorced/single moms, but it's more often when Terry is out of town, because he's not an incredibly social person anyway, much less to hang out with my friend. I think that's acceptable and a good way to fellowship, but I also do think I need to make more of an effort to include unmarried folks.